What is an Approved Partner? An OSRAM Approved Partner is an online retailer (our partner) that is approved to sell genuine OSRAM products online. They will only stock and sell genuine OSRAM automotive parts and accessories, so if you buy any OSRAM product from them, it will be 100% genuine. How do I know I am buying from an Approved Partner? 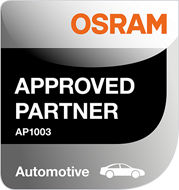 Wherever you see the Approved Partner Logo you can be rest assured that they are approved to sell genuine OSRAM products. Every Approved Partner has been issued with a unique AP reference number and logo (which also shows their unique reference). An example of this is: AP1001. How can I be sure the OSRAM HID (Xenon) bulbs I purchase are not counterfeits? Counterfeiting has become a problem for all aspects of the automotive aftermarket. In more recent years this has developed into the replacement bulb market. More and more counterfeit bulbs (in particular HID bulbs) are making their way onto the market and are being sold online and offline. If you buy replacement bulbs from our Approved Partners you are guaranteed to be buying genuine OSRAM products. You can now verify your HID bulbs online with the new OSRAM Trust Programme. What products do Approved Partners sell? All of our Approved Partners stock an agreed range of OSRAM products including Original 12V and 24V headlight and auxiliary bulbs, upgrade halogen and HID bulbs, retrofit LED bulbs, aftermarket fit LED fog and DRL kits and LED accessories such as torches, road flares and hand held inspection lamps. Who do I call when I have a problem? All of our Approved Partners guarantee a certain level of Customer Service and Technical Support. Should you have any questions or queries please contact the Approved Partner you purchased your products from in the first instance. We would always recommend you keep your receipt and packaging for the products you purchase through our Approved Partners. Should you ever need to return anything they are likely to ask for proof of purchase and the packaging.